The date was 26th April 2012. A memorable day for us-it was our first fishing trip together. We had been planning for this trip for quite a while now. The day had finally come to bring out our rod, reel, bait and sheer determination to catch our prized fish ! 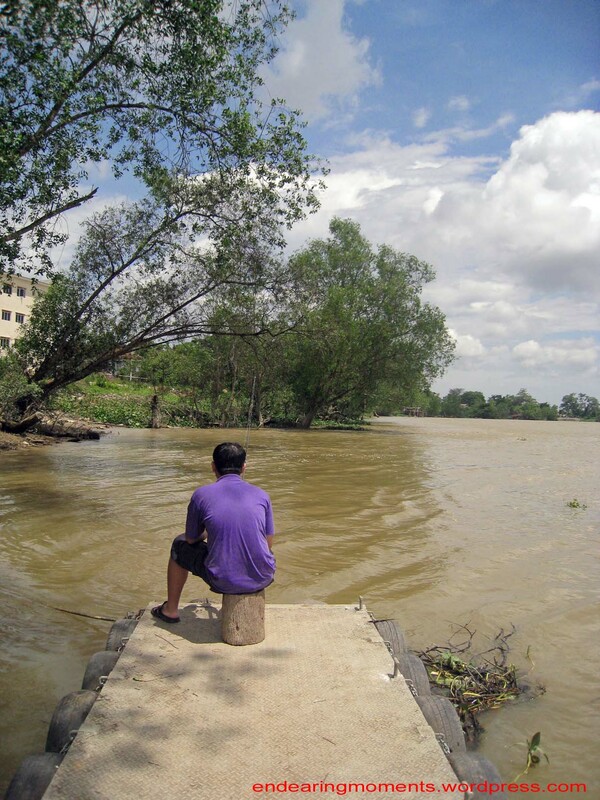 The Northeast monsoon season in West Coast Malaysia ended last month and water levels now are steadily low. It is a good time to fish now, as the fish are more concentrated and the fish fries that were born during the rainy season have grown to a considerable size. Here is some educational info about monsoon. Monsoon: the rainy phase of a seasonally-changing pattern, although technically there is also a dry phase. It is called locally – musim tengkujuh (Malay), 雨季 yu ji (mandarin chinese). 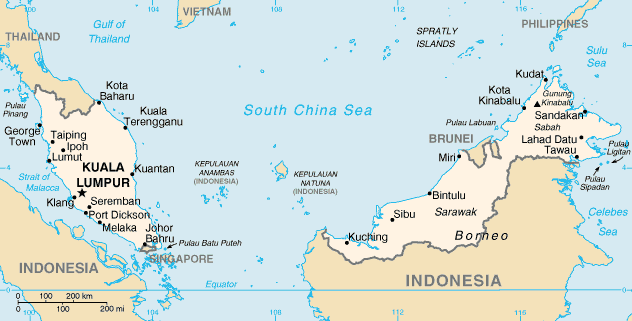 Malaysia faces two monsoon winds seasons, the Southwest Monsoon from late May to September, and the Northeast Monsoon from November to March. The Northeast Monsoon brings in more rainfall compared to the Southwest Monsoon, originating in China and the Northern Pacific. The southwest monsoon originates from the deserts of Australia. March and October form transitions between the two monsoons. 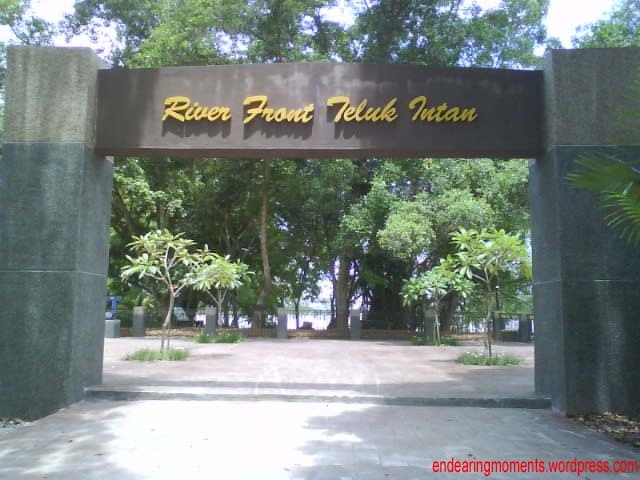 Our fishing spot is a fishing platform located in the Perak River Waterfront of Teluk Intan. Here is the location in graphic. The gate welcoming us to our fishing spot. 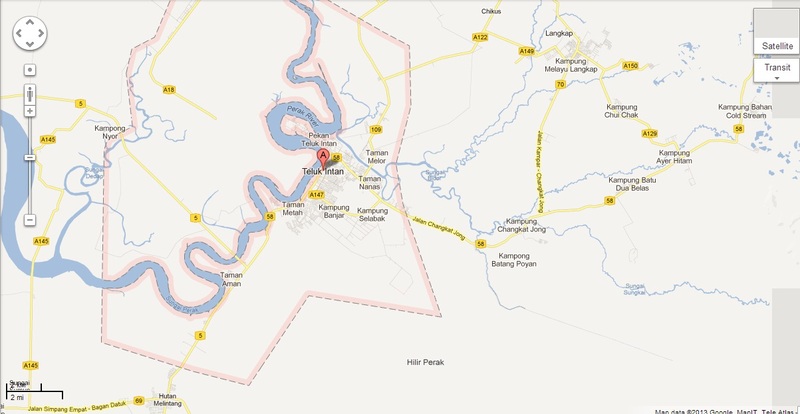 The area marked is Teluk Intan- a small city; full of history,culture and resources. 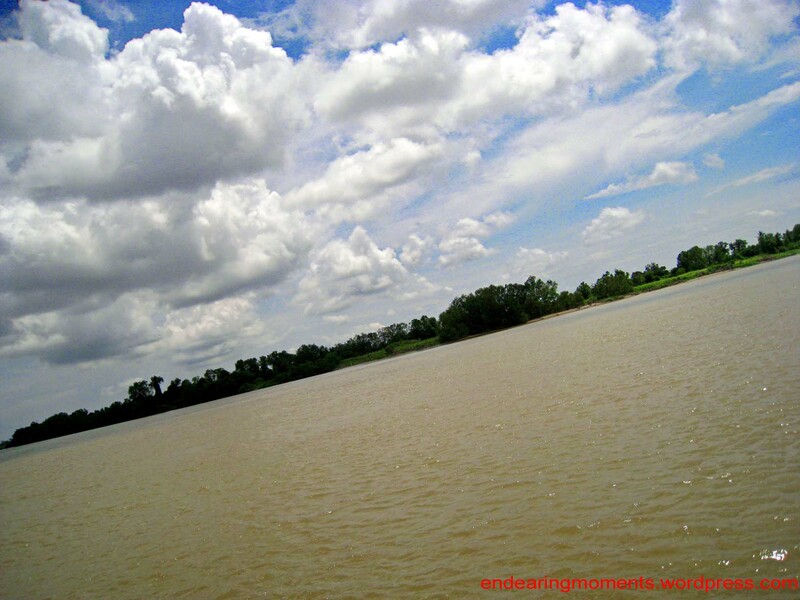 This particular spot is famous for giant river prawn fishing. 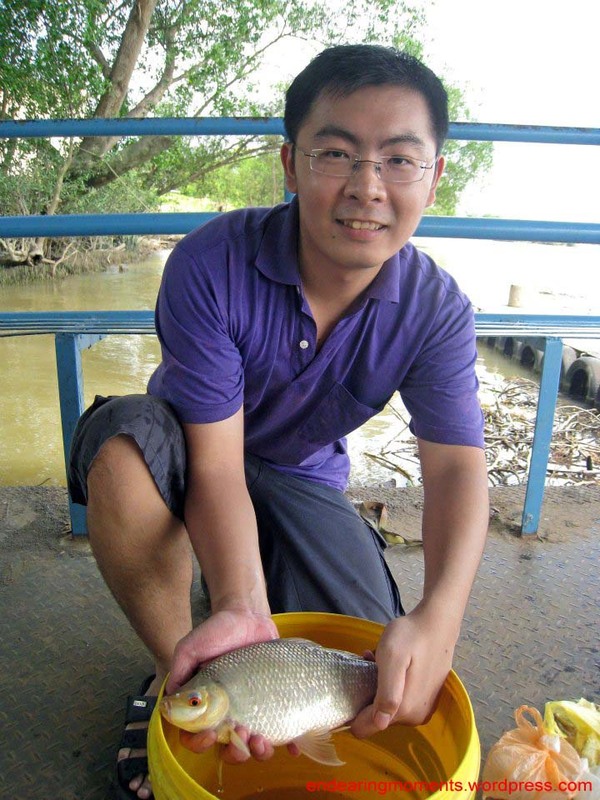 The method to fish for giant river prawn is to use a bottom rig, a small hook of size 7 or 8 with a bait of earthworms. 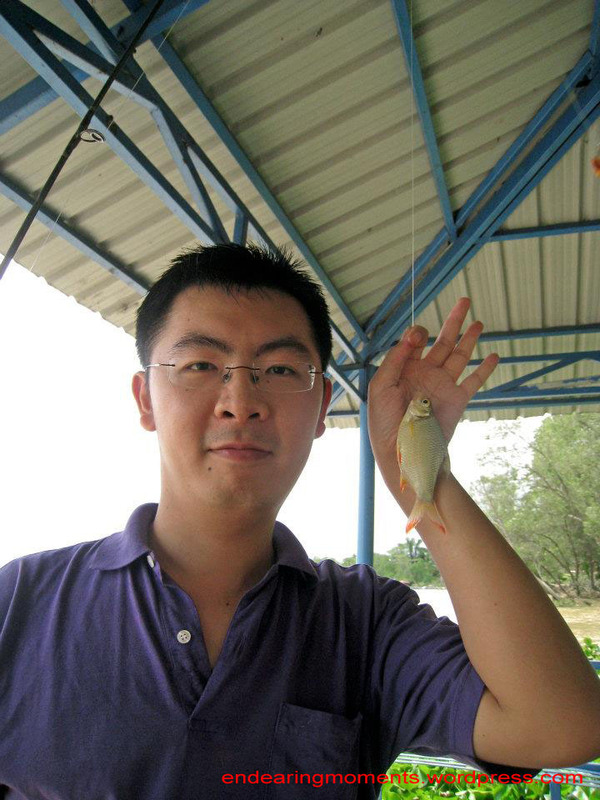 Since our intended catch today is fish , we will come back here for giant river prawn fishing some other time. Local name: Udang galah (malay) Galah means long stems of bamboo, i.e referring to the prawns long pincers. (Mandarin Chinese) -淡水龙虾 dan shui long xia or 蓝钳 lan qian. The first meaning river lobster, the latter – blue pincer. We arrived at the platform at about 9am.Without haste, we took out our gears and started gearing up for “the fight” awaiting us. Our bait was oil palm and chicken intestines. 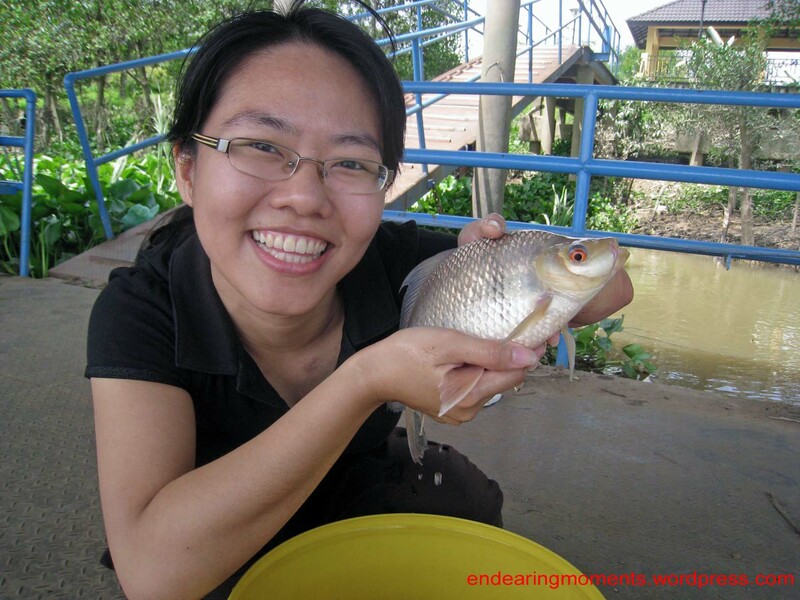 Maybe you would be surprised but oil palm is very effective bait in these waters, especially if the target is omnivorous fish like carps or barbs. Chicken intestines on the other hand, work miracles if you are fishing for catfish species. With our bait sunk into the murky waters, our exciting fishing trip officially started! Waiting patiently on the best fishing spot available. Within a few seconds, I felt minute vibrations on my rod. Small fishes were picking on my bait. I did nothing. The strategy is to let the small fishes gather and graze. The commotion will attract bigger fish to come and take a lion’s share. Suddenly, I felt a moderately strong tug on my line. I tightened my line, and reeled the mysterious fish in. 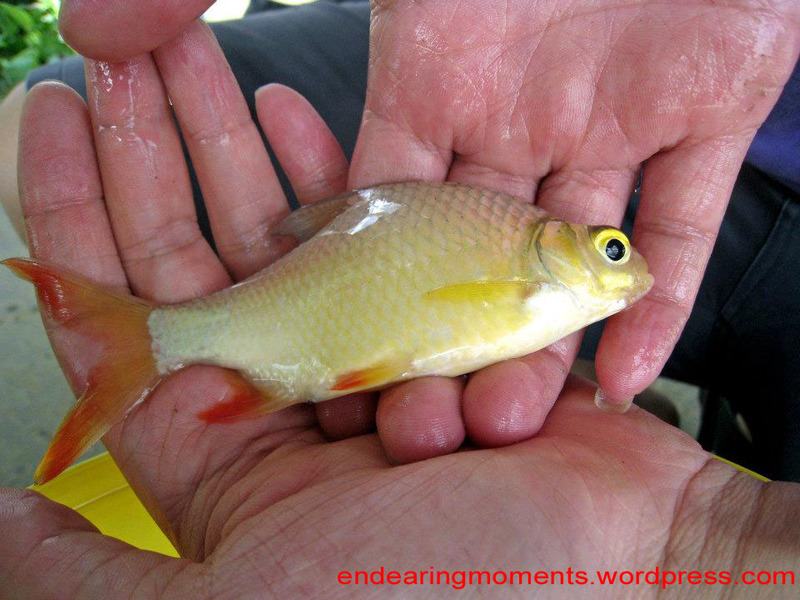 It did not fight too hard, so before it even came near to the surface, I knew it would be just a small fish. First fish up – Red tailed Tinfoil Barb. A beautiful, cute fish to kick start our trip! Our first fish of the day,a small,yet meaningful catch ! Unhooked the fish, put it safely in our pail. Continued fishing, feeling so excited. 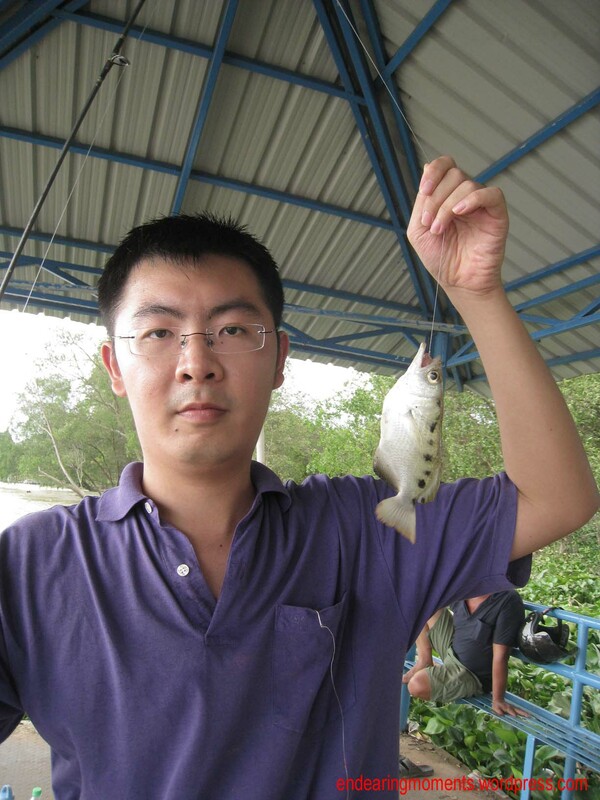 Again small fishes were nibbling at my oil palm bait. Out of a sudden, my rod bent and line was screaming out of my spool. I bent my rod and started cranking in line. After 2 minutes of struggle, I finally landed my very first Ikan Ara aka Ikan Kelabau. I’ve dreamed and was so obsessed about landing this fish ever since I saw an old angler catching it in this very same spot, a few months ago. Landing it at that very fateful day, was like a dream come true. The excitement and satisfaction was inexplicable. After catching my dream fish, I was so excited and satisfied, I did not need to fish anymore! So, Jen took over and did the fishing. We changed to chicken intestines hoping to catch some catfish. 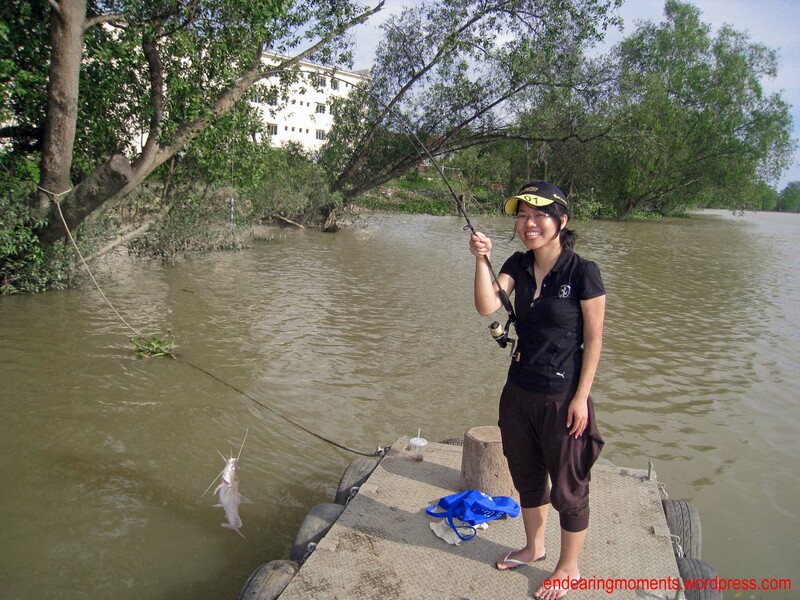 A few minutes into fishing, there were some small but continuous tap on her rod. She tightened her line and the rod bent. Yes! Fish On! It was her first attempt at fishing and honestly, she was a little awkward with the gear. She kept on shouting “so heavy, so heavy” while reeling the fish in. 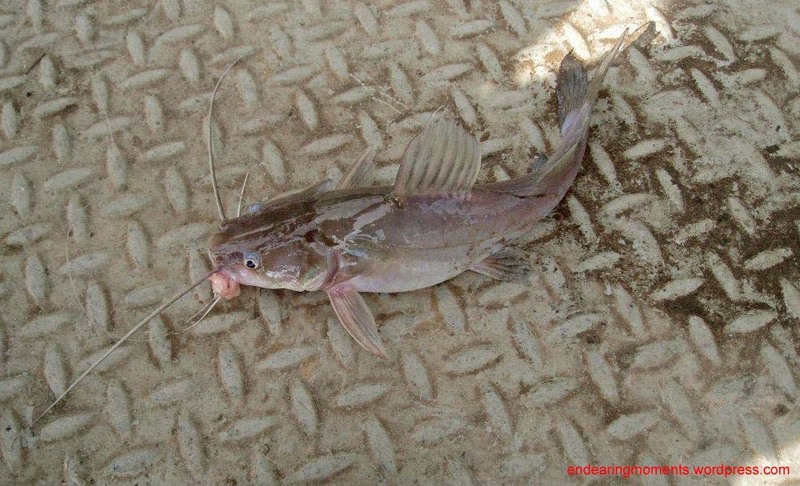 Despite that, she landed herself a sizable catfish all by herself. As her personal fishing mentor, I’m very proud. Proud Jen with the first ever fish in her life, she caught herself ! 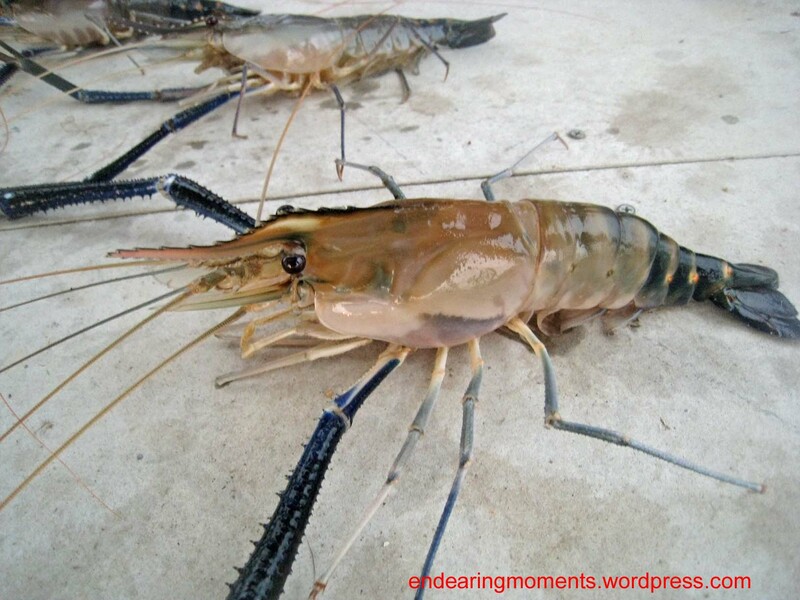 A species over-fished for its prized flesh which is considered a delicacy in Malaysia…big ones are less now…beautifully streamlined with pompous display of fins…be careful not to get stung by its pectoral n caudal stings which contain toxin that destroy tissue(muscle). After landing the catfish, we decided to take a break and just chillax. The river was light brown in colour with tinge of olive green. The warm breeze kept cruising in. Trees were swinging aloft with grace. We can’t stop to imbibe the beauty of Nature. As we were gazing into the ripples, a particular fish caught her eyes. 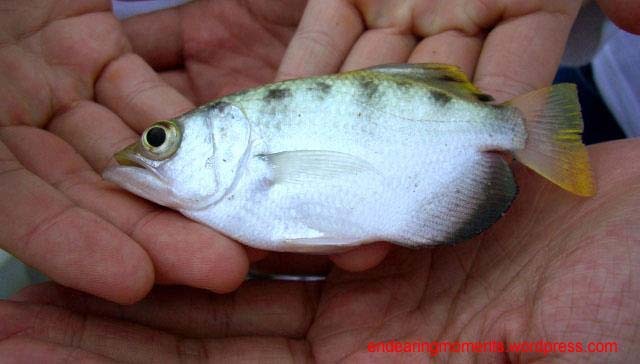 It was a big archerfish. Honestly, I do agree that the fish is cute. I took out my gear and casted towards the archerfish. Wham. With lightning it struck my bait. Malaysia is blessed with a diverse fauna. Info: When an archerfish selects its prey, it squirts a jet of water at its victim. Previous 8TV 9th Anniversary 8venture in Teluk Intan! Next Fold Some Fun into this Chinese New Year Decoration with Koi Fish!